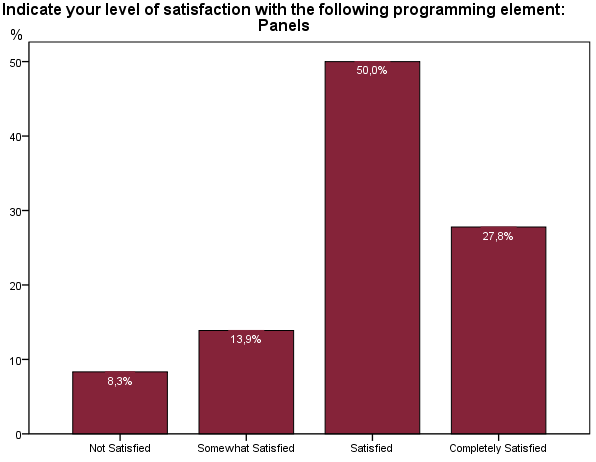 If you would like to dig deeper into the results, you can do so below. Click on the graph to the left and find the responses to questions on the right. If there were several questions, we aggregated them. We, in this case, is Elena - thank you very much! 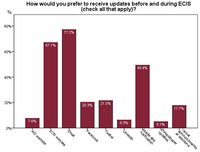 You can find the responses to sub-questions as bullet lists below the main topic on the right. If you would like to know what we have learned, have a look at the bottom of the page. 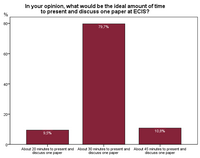 Bettina aggregated the responses to open-ended questions - thank you very much! 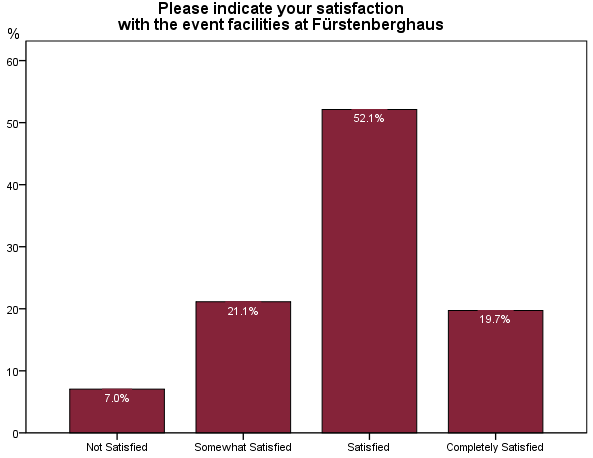 If you would like to run a conference in the future, maybe use it to learn :-) With some things you will not have to deal anymore - e.g., the budget for renovating Fürstenberghaus was, unfortunately, limited ;-) Thank you very much for your patience here! What kind of paper did you present and/or in what activities were you involved? 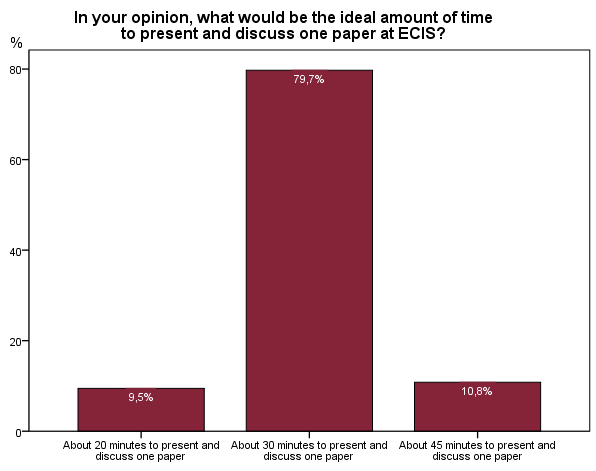 In your opinion, what would be the ideal amount of time to present and discuss one paper at ECIS? 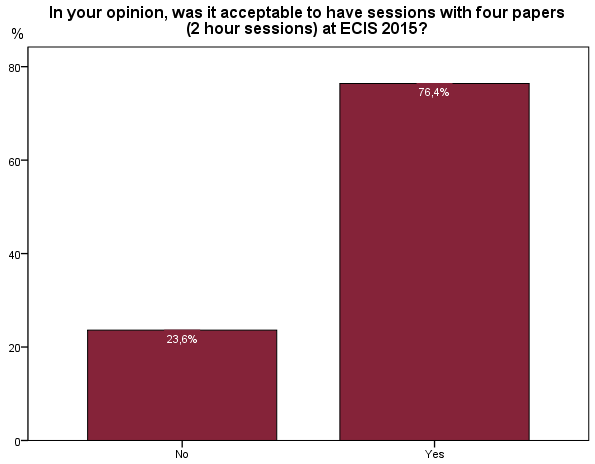 In your opinion, was it acceptable to have sessions with four papers (2 hoursessions) at ECIS 2015? 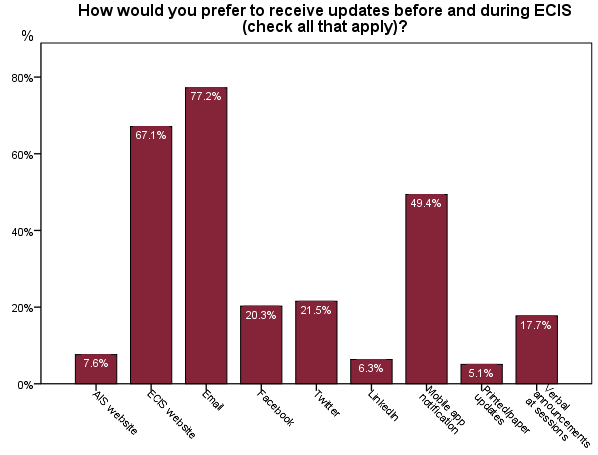 How would you prefer to receive updates before and during ECIS (check all that apply)? 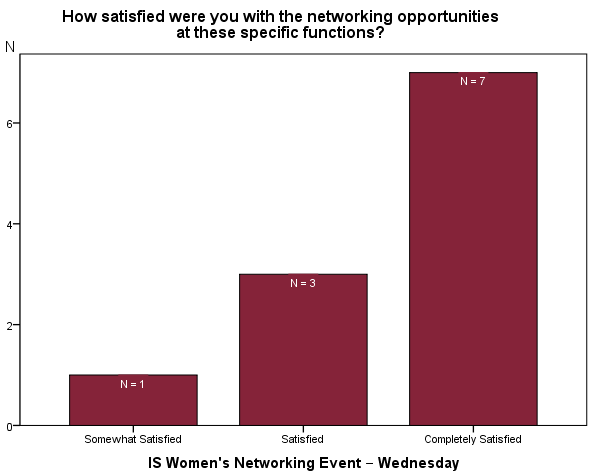 How satisfied were you with the networking opportunities at these specific functions? 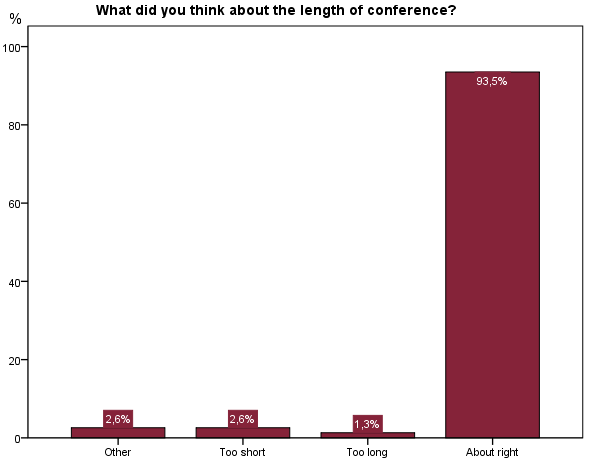 What did you think about the length of conference? 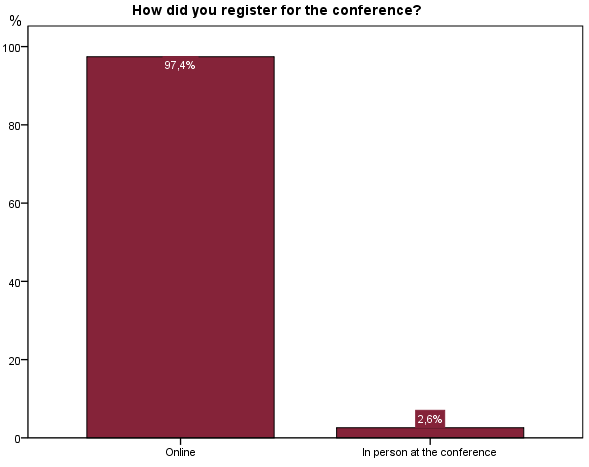 How did you register for the conference? 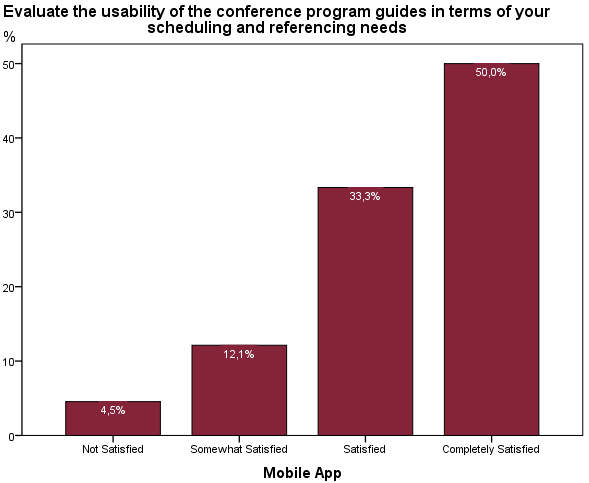 Did you find useful any of the “Treasures of the Week” (ToW) published on the conference website? 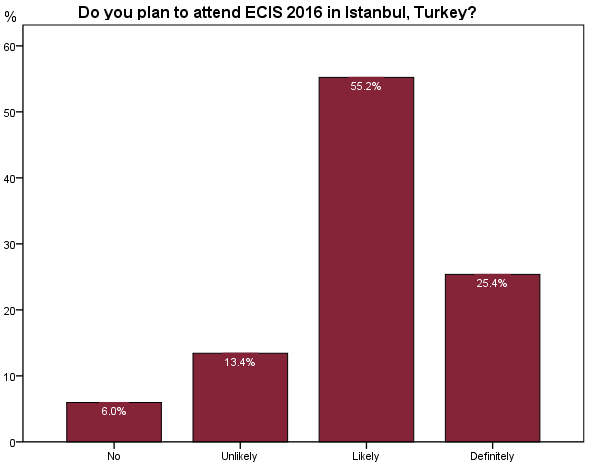 Do you plan to attend ECIS 2016 in Istanbul, Turkey? 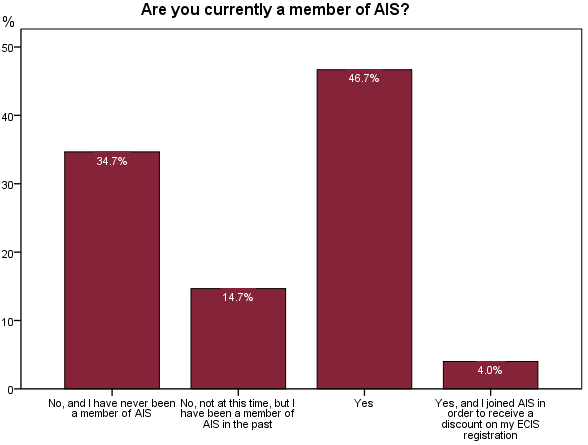 Are you currently a member of AIS? 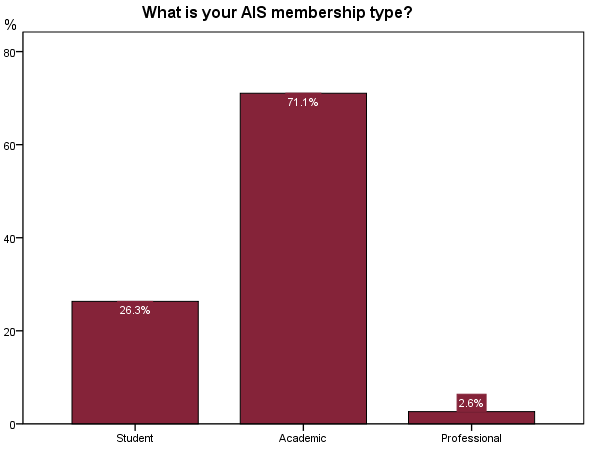 What is your AIS membership type? 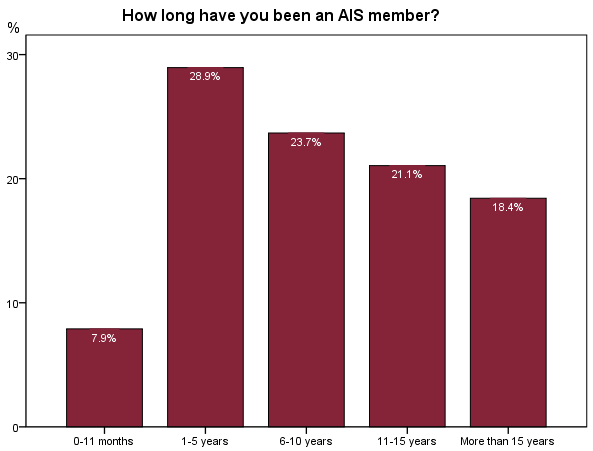 How long have you been an AIS member? 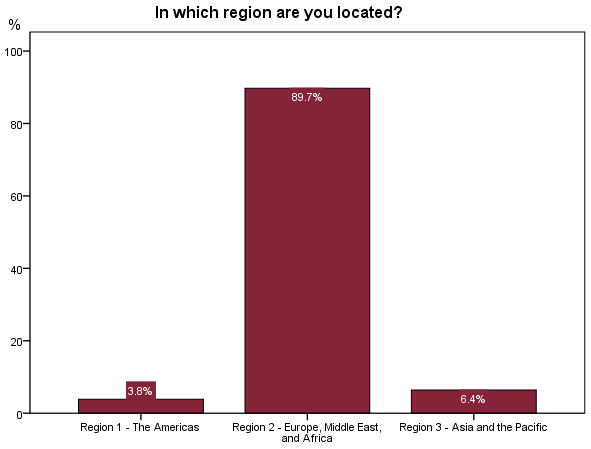 In which region are you located? 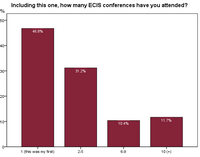 Including this one, how many ECIS conferences have you attended? 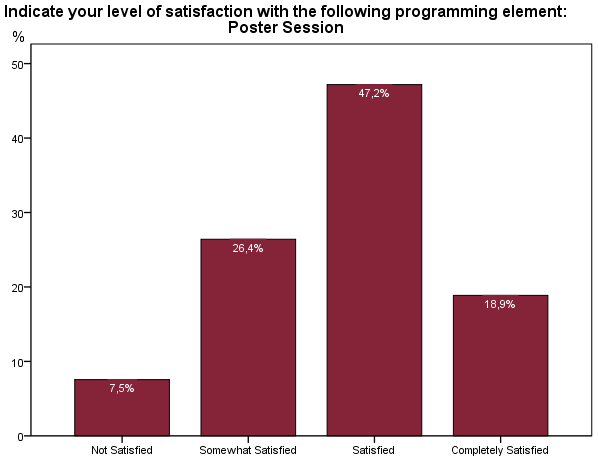 Overall, the poster session received a lot of the critique. Whereas the quality of the posters was mostly appreciated, attendees were disappointed about the location (too small room for too many people/ session was overcrowded, so that discussions or at least calmly reading the posters was not possible). Also, some mentioned that the scheduling was unlucky since some other events were taking place at the same time which reduced the individual’s opportunity to network. Of those who assessed the accommodation in Munster, all were unsatisfied concerning the prices, the location of the hotels (too far away) and/or the language of the websites (sometimes available only in German). 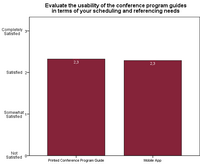 Thus, it could be helpful to provide some guidance in the run-up of the conference on a variation of accommodations. 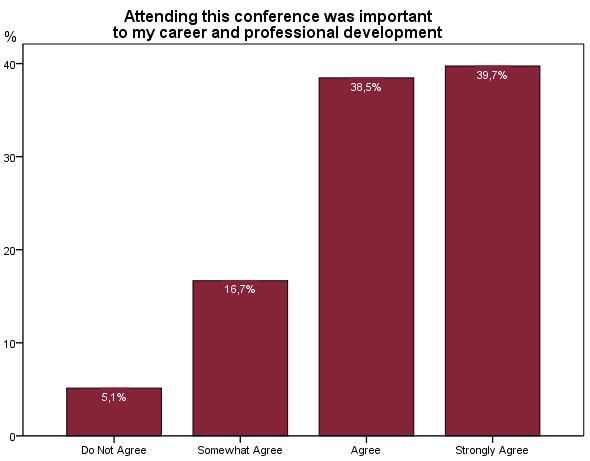 Some stated that the conference was not international enough and that the backgrounds of the attendees were too similar. 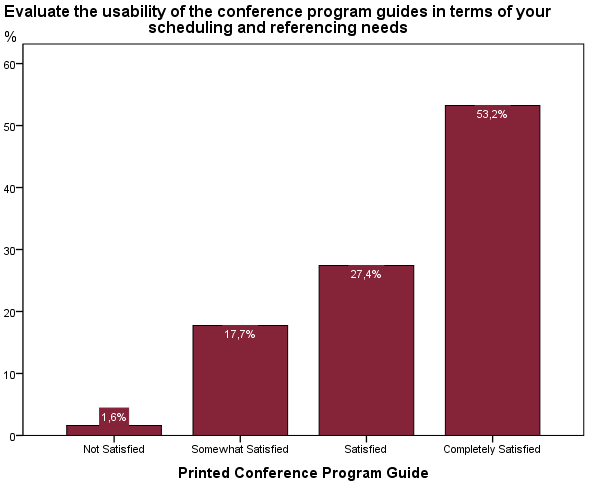 In contrast, the conference city in general was judged as suitable. The location of the conference at the University was judged differently. 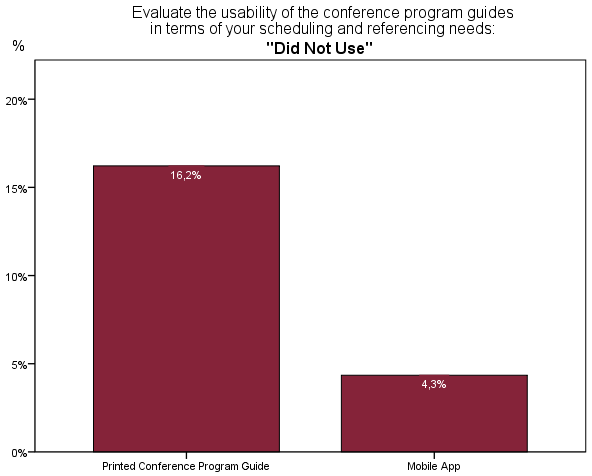 While some liked the university as conference location in general, some criticized the size and appropriateness of the rooms (too small, lacking seats, ambience) and the surrounding (constructions and resulting construction noise). 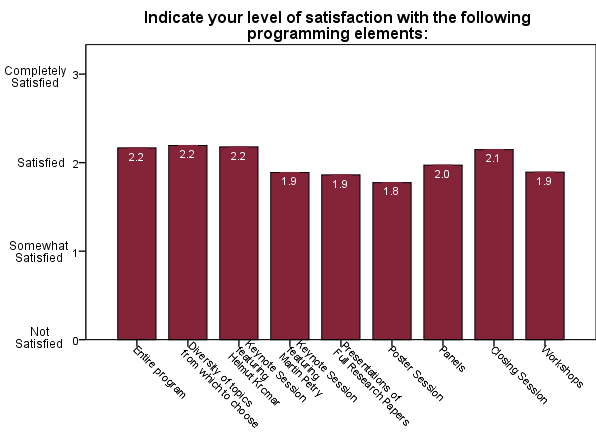 The location in general (Munster and the centrality of the university) were judged rather positive. Thus, it is recommended to consider carefully the size of the available rooms, the location of the venue and the surrounding. 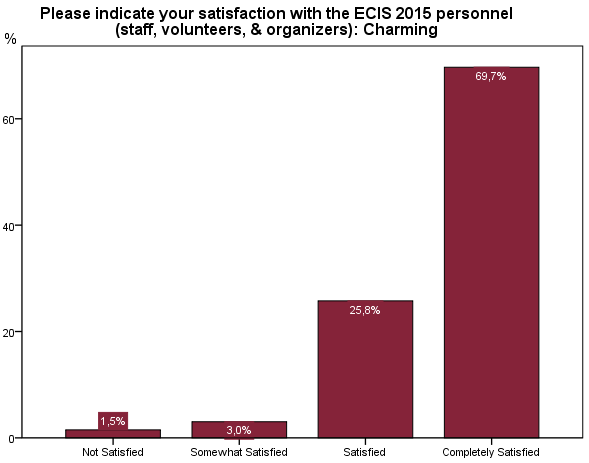 Overall, the registration and the on-site check-in process were seen rather positive. 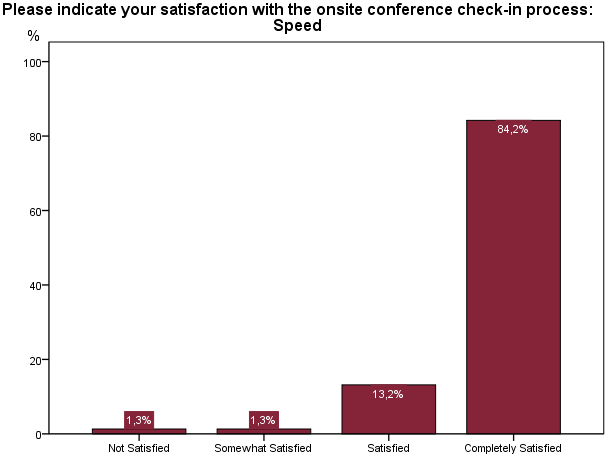 It could be worth consideration to rearrange the counters: A grouping of the counters not by alphabetic order but by number of attendees per letter, could speed up the check-in process. The 'Food-&-Beverage'-Section gained quite much critique. 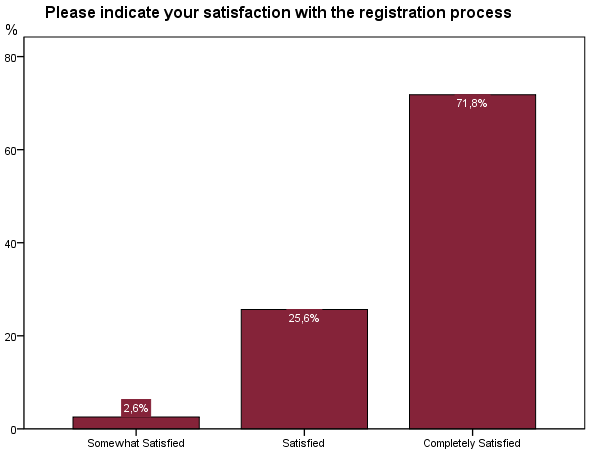 Most respondents indicated a low quality, no adherence to dietary needs (although tested during the registration), no indication of ingredients and a low healthiness of the food. 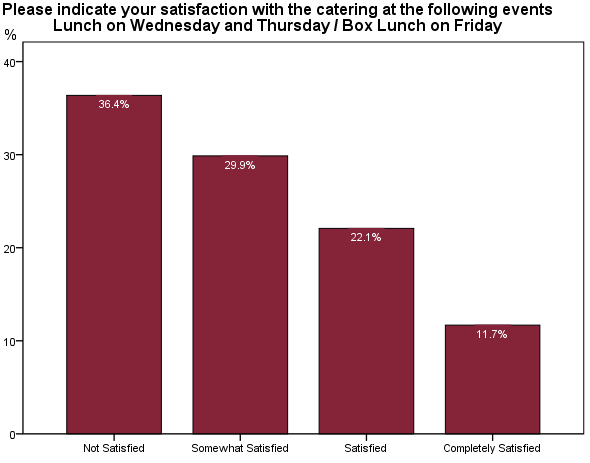 Also, some claimed that the locations were not appropriate concerning options to sit, the high amount of attendees and the overall organisation of the serving of meals. 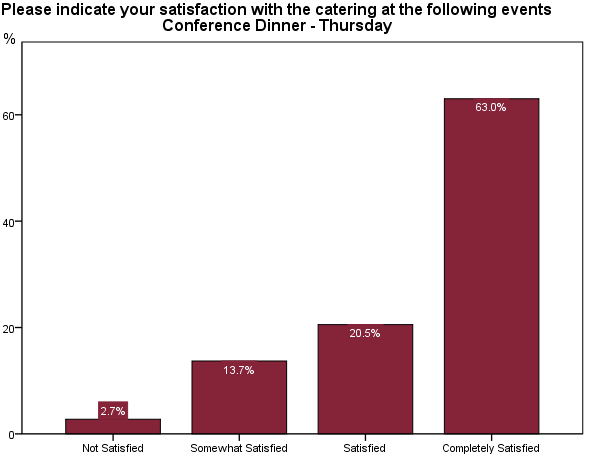 The conference dinner was overall judged slightly more positive. Thus, it is recommended to pay particular attention to the quality of the food, the variety concerning dietary needs or wants (like vegan, vegetarian or gluten-free food) and the size of the rooms where the food is served. 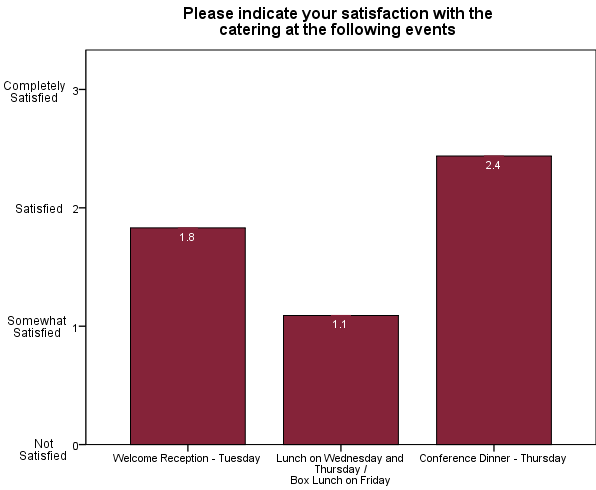 If dietary needs are tested during the registration, they should be considered in the planning of the meals. The rooms where the food is served should be big enough to offer plenty of seats as well as making conversation possible. The programme guides were overall judged rather positive. 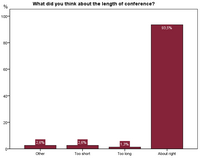 Most of the respondents thought they were helpful in planning the conference days. 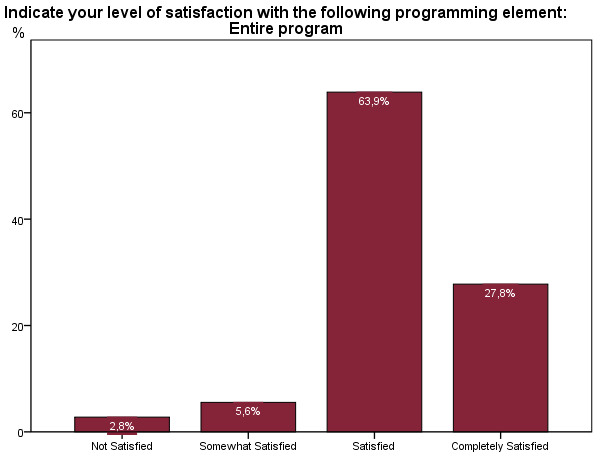 Especially the mobile app gained praise. The layout, design, compatibility of offline and online versions as well as the structure gained some critique. In addition, some mentioned that the mobile app made the printed programmes obsolete. 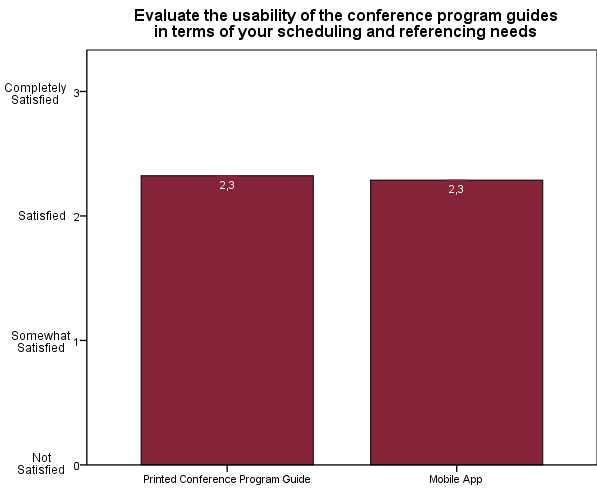 Thus, it is suggested to improve the overall design, layout and structure of the programmes (printed programme and mobile app). Since more and more people are using mobile phones, it could be worth considering handing out printed programmes only to those who want or need one. 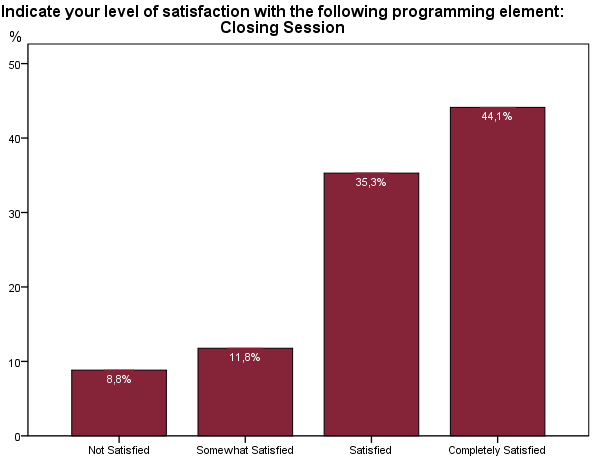 The respondents thought that the programme, in general, was quite good. 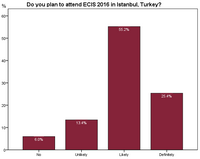 Most liked the diversity of the topics as well as the scheduling of each item on the agenda with little overlaps. 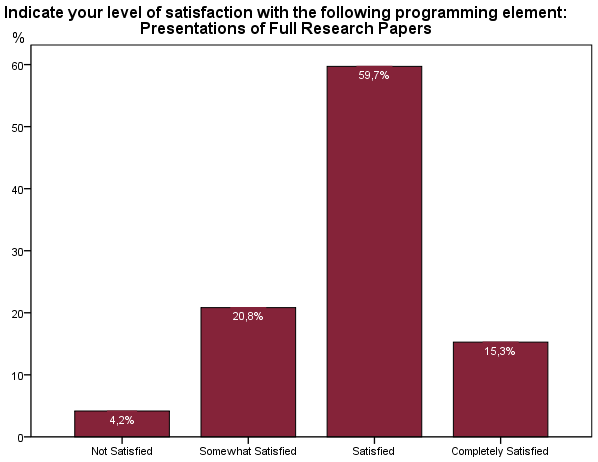 Concerning the quality of the papers and presentations, respondents have differing views which makes generalizations quite difficult. 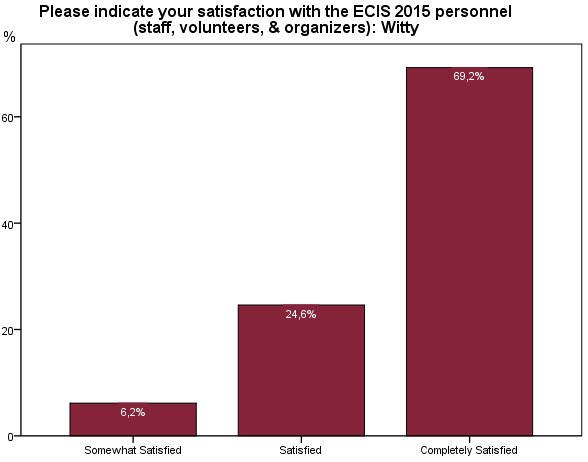 Regarding formal aspects, the quality of the presentations was judged rather low despite the guidelines of the ECIS Chair. This should be improved. 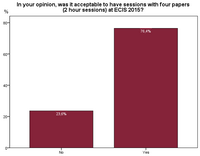 Much criticism was voiced regarding the poster session. Most mentioned that the room was too overcrowded and simply unsuitable for this event. Thus, it was hard to discuss and read the posters attentive and in quite. 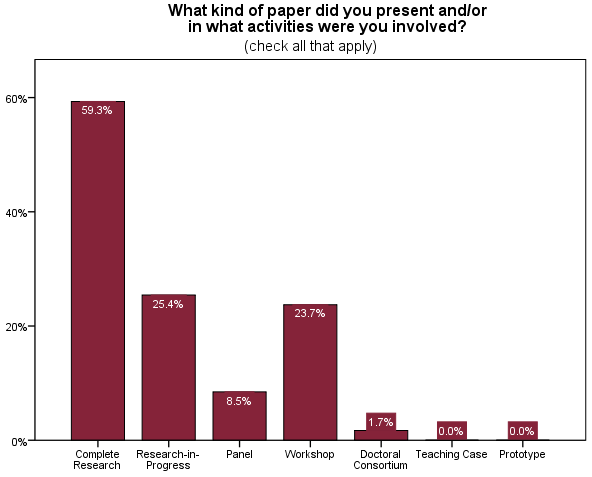 Since some respondents mentioned that the poster session was also seen as a networking opportunity, there should be enough space for all attendees and presenters to get into a conversation with each other. 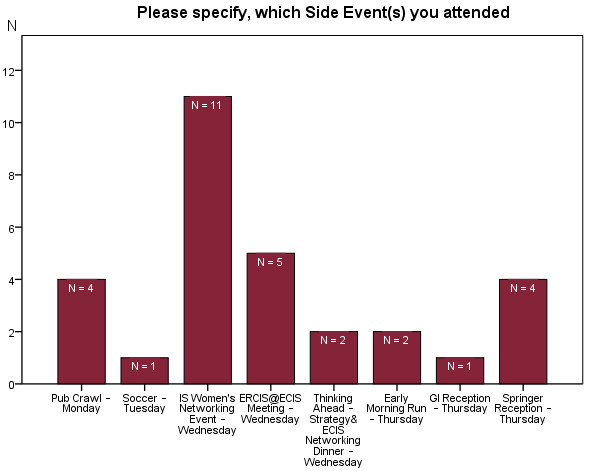 In addition, the timing of the poster session should be reconsidered, ensuring that no other networking event (like the IS-women networking event) runs parallel. The organisation of the conference was evaluated very positive. 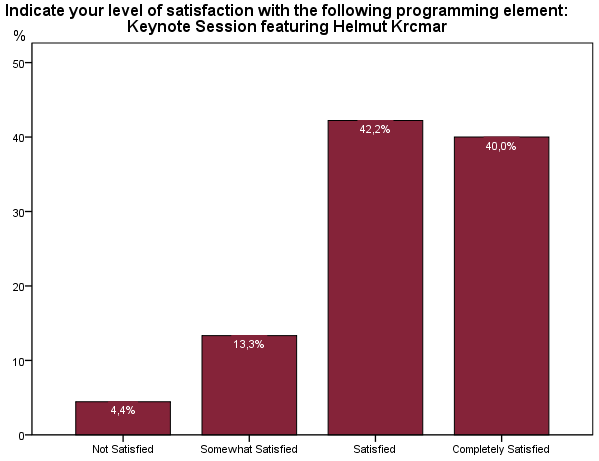 Most of the attendees appreciated the trouble-free run of the conference and the information in the run-up as well as during the conference. The side events were also seen rather positive. Those, who commented negatively, referred mostly to the location (as mentioned above: missing seats, general unsuitability of the rooms). Again, the location of the venue should be carefully considered, regarding the different needs and wants of the attendees like spaces to network, options to sit, work and refresh, etc. Overall the ‘Treasure of the week’ was judged positively. It seems that although to some it does not provide any help or is not of value, it does not bother anyone either. Those who judged the ToW positive thought it was helpful and made the conference city more interesting. 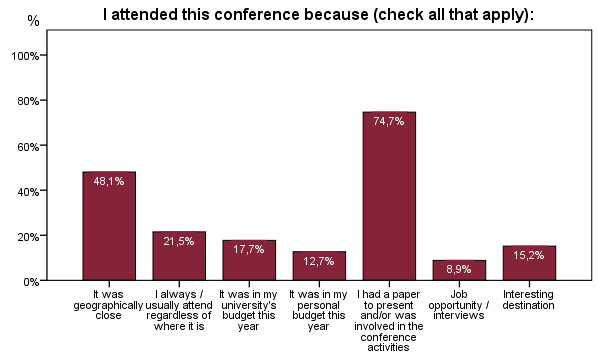 One respondent mentioned that it made the organisers seem caring and that it gave the conference a personal touch. The open-ended questions of the questionnaire were answered by average 13% of the respondents. The results are therefore only limited resilient. 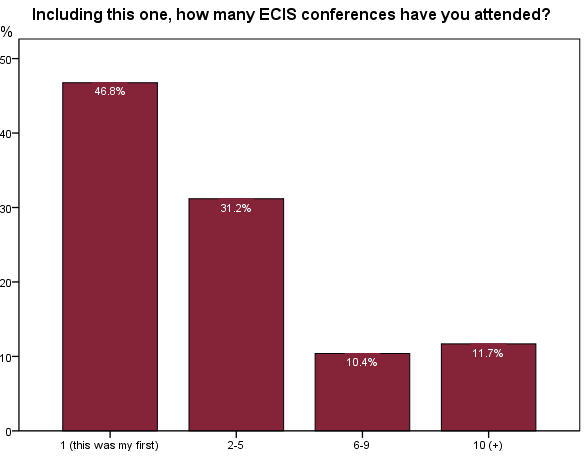 Questions with low answer rates (like “How would you prefer to receive updates before and during ECIS (check all that apply)?” or “What did you think about the length of conference?”) should be excluded from the questionnaire so that the respondents save time and presumably are more willing to answer other open-ended questions (more detailed). Perhaps it could be informative to include some more programme specific questions (e.g. 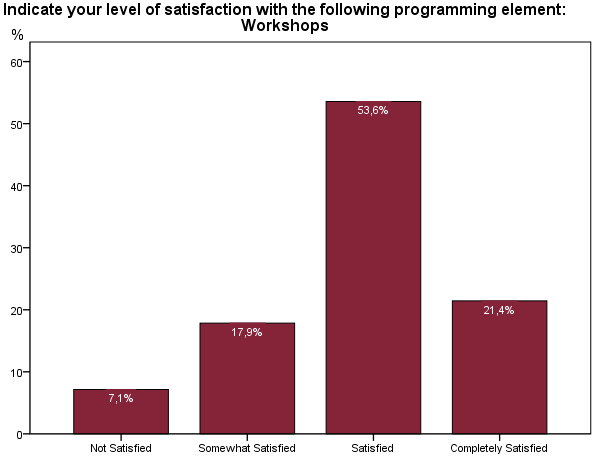 questions concerning the quality of each track or session). 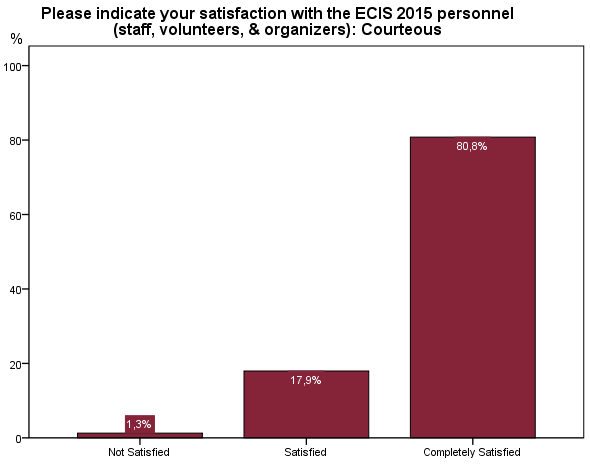 In addition, it could be helpful for the organization to have a second, shorter questionnaire for the speakers to get some feedback on how they perceived the organization and information in the run-up as well as the moderation of the discussions, etc.